Explanation: Brighter than ever expected, comet LINEAR -- you know, the one designated C/2001 A2 -- is a sight to see in southern skies. This comet LINEAR first brightened impressively in late March as its active nucleus began to fragment, prompting some speculation that the comet might soon break up completely. But still hanging together after its closest approach to the Sun, C/2001 A2 suddenly brightened again and was reported last week to have reached nearly 3rd magnitude, easily visible to the unaided eye. 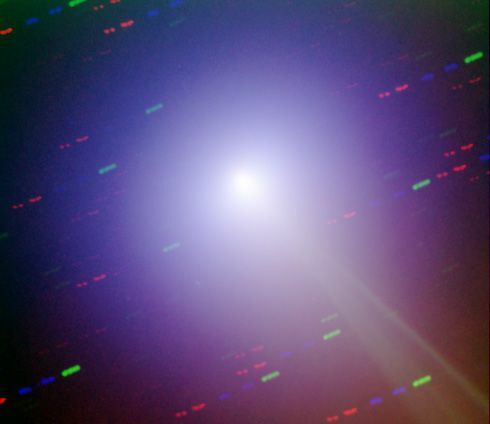 This delightful telescopic picture of the brighter coma of comet LINEAR was recorded from Australia on June 20. 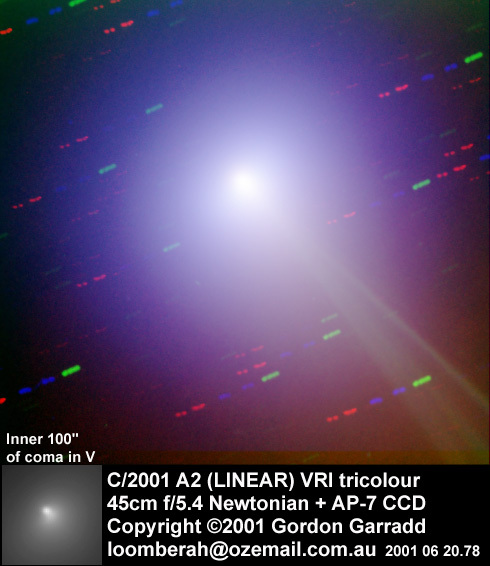 Stars seen through the tenuous coma and filamentary tail appear as a series of short trails in this three-colour composite image registered on the comet. North is up and the scene covers about half the width of the full Moon. Now moving through the constellation Cetus, comet LINEAR will be north of the celestial equator by July 4 as it comes into view for eager northern sky-gazers.